We are used indico as our meeting management system to manage the meeting. We face the issue as try to upload file that file name with Chinese alphabet， then we will received error message like failed to upload file. Base my experience , The Chinese filename problem is caused by the way Python handle utf-8 coding.but I don’t know how to solve it. Can anyone give me any suggestion that how to solve the issue. Many thanks. Which version of Indico are you using? our indico link as https://indico.leeinst.sjtu.edu.cn and i am fresh new of indico administrator. This is an old version that was never supposed to be used in production. It is unsupported and you should update as soon as possible to the latest supported version. Unfortunately this will be a very painful update since you go through all the intermediate steps manually (which is we we always told people to not use 1.9.x versions in production). base your recommendation, i would like to install latest supported version of indico in my new server. my new server run on CentOS 7 and want to apply OAuth 2 as my new sso. so my question is how do i migrate db from old server to the new server. base on your previous post, i use the last one which is Upgrade Indico from 1.2.
so i follow the step to do the upgrade. please give me some advise that how to do that. 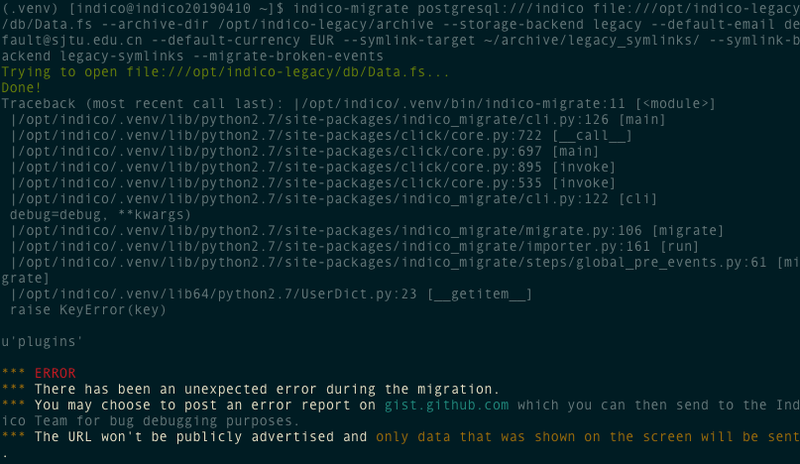 You cannot use indico-migrate to migrate from an older 1.9.x version. That’s why I included the other links. This upgrade won’t be pleasant for whoever runs it as it involves tons of manual steps. Not keeping the old data and starting from scratch would actually be easier if that’s an option for you! first of all, i would like to say thank you to you. for other links you provide on previous post it should be run on system which i install the old version of indico, but i really be afraid of to do that upgrade on the old server. if the system is damage of indico then i will no system to support my current business. run the code to the manual upgrade. or any other advise ?